The cave at Porthcothan Valley is something of an enigma. 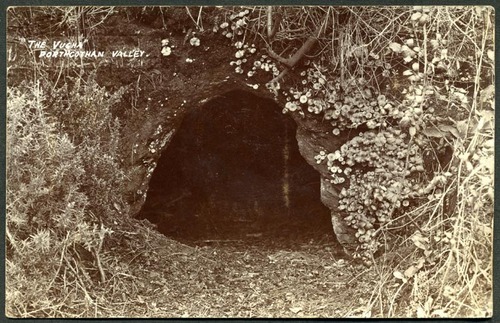 The Reverend Hawker described how the cave had been used for smuggling, and there are suggestions that it was used as a hideout during the civil war. The cave is undoubtedly man-made, and Howard Balmer points out, in issue 51 of Meyn Mamvro,1 that prehistoric pick marks can be seen, best viewed from the rear of the chamber, and that the cave has very good acoustic properties; a quality thought to be of importance to the people of the prehistoric era. Howard also spotted a Neolithic axe at the Royal Cornwall Museum, and which had been discovered at this 'Long Vugha' in St Eval. The cave is marked as a fogou on the 1st edition 6 inch Ordnance Survey plan of 1888. This rare photographic postcard shows the small entrance to the 36 feet long chamber. 1. Balmer, Howard. 2003. 'The Porthcothan Fogou'. Meyn Mamvro 51, p22-24.